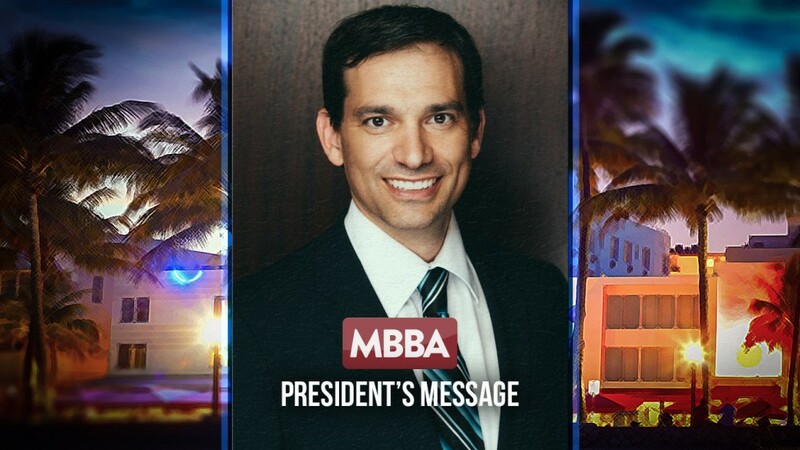 It is my great honor and privilege to serve you as the President of the Miami Beach Bar Association (MBBA) along with our well-qualified and dedicated officers and board of directors. As one of the premier destinations in the world, Miami Beach is a vibrant and trend setting city. 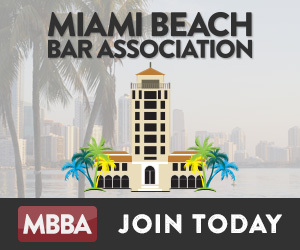 As a result, we, as members of the Miami legal community, and the Miami Beach Bar Association, have a unique opportunity to take advantage of that fame to better both our community as well as improve the quality and perception of lawyers and the law. Further Focus and Commitment to Diversity and Inclusion. With all that has happened in our recent election cycle, we are a country in need of healing, especially in terms of race relations. No matter what your political affiliation, if you are Miamian, you surely appreciate the richness and splendor that comes with diversity and the exchange of cultures and ideas. It is this very attribute that makes our country a leader among the countries of the world. I will make a concerted effort to draw attention to the positive results which come from increasing inclusion, diversity and fairness in our justice system, the legal profession, and in our interaction with each other in our ordinary discourse. Education and Access to Justice. Through all of our educational activities which range from our CLE seminars, to our Law Day speaking circuit and essay and poster contest, we can continue to further our goals of admiration for the law and the promotion of fairness, equality and diversity. We also can improve access to justice by continuing with our pro bono clinic participation as well as encouraging pro bono service. Along the foregoing lines, I plan to continue getting out our message and accomplishing our goals by putting on our monthly CLE luncheons as well as Law Day events and judicial events and happy hour receptions. And, in doing so, I plan to have the Miami Beach Bar Association work with the Dade County Bar Association and other bar associations in producing events of mutual interest and benefit to our memberships. In addition, I hope to foster partnerships with the Miami Beach Chamber of Commerce Law Council and the Miami Beach Latin Chamber of Commerce to produce upcoming events to allow greater exposure to other groups and people to discuss the practice of law. There are many ways to get active in the Miami Beach Bar Association and I hope you maximize your membership. Your participation is critical to the success of the organization. I encourage you to join one of the Committees. Committees are the backbone of the organization. Committees identify needs, give birth to creative solutions, and implement our goals. If you want to get involved, let me know. If you are not familiar with our Committee structure, look for details on-line here or in our By-Laws. Become involved, share your ideas, and volunteer your talents. By working together we can accomplish more than by remaining separate. Please contact me with any suggestions, ideas or questions. I may be reached at pvalori@dvllp.com. I look forward to working with you all in 2017 and sincerely hope that we may continue the proud tradition of honor and excellence of the Miami Beach Bar Association!